Thanks for your visit, I'm happy. You remember this year the 50th anniversary of the College of Jesus, opened on the initiative of Father Arrupe in 1968. In the fiftieth year, that of the Jubilee, Scripture says that "everyone will return to his property and his family" (Lv 25,10 ). But nobody has to pack! However, all of you are called to return to the "place" that is there, to "desire what is essential and original" (St. Peter Favre, Memorial, 63), to revisit the family in which God has regenerated you, where you professed belonging to Him. God founded you as Jesuits: this jubilee is a moment of grace to remember and feel with the Church, in a Company and in a belonging that have a name: Jesus. Remembering means to be founded again in Jesus, in his life. It means reaffirming a clear "no" to the temptation to live for oneself; to reaffirm that, like Jesus, we exist for the Father (cf. Jn 6:57); that, like Jesus, we must live to serve, not to be served (cf. Mk 10:45). 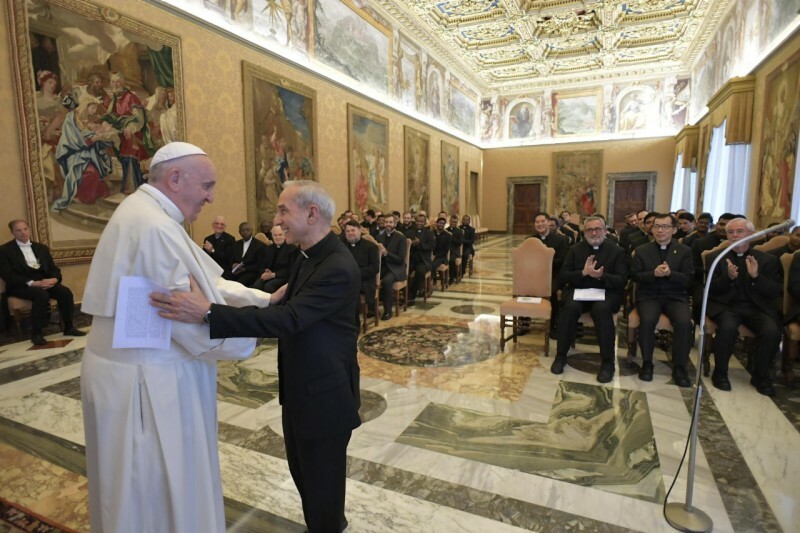 To remember is to repeat with the intelligence and the will that the Passover of the Lord is enough for the Jesuit's life. You do not need anything else. It will do well to resume the second week of the Exercises, to re-establish oneself on the life of Jesus, on the way to Easter. In order to form itself, it is first and foremost to be founded. On this I allow myself to advise you, to return to the Colloquium of service to be like Jesus, to imitate Jesus, who emptied himself, annihilated or obeyed to death; the Colloquium that brings you up to the moment of persistently asking for slanders, persecutions, humiliations. This is the criterion, brothers! If someone fails in this, talk to his spiritual father. Imitate Jesus. Like Him, on that road that Paul tells us in Philippians 2,7, and not be afraid to ask, because it is a beatitude: "Blessed are you when they say bad things about you, will slander you, persecute you ...". This is your way: if you can not do that Interview with your heart and give your whole life, believe and ask for this, you will not be well rooted. Therefore, being founded is the first verb I would like to leave you. Saint Francis Xavier wrote about it today: "I beg you, in all your things, to found yourselves totally in God" (Letter 90 from Kagoshima). In this way, he added, there is no adversity to which one can not be prepared. You live in the house where St. Ignatius lived, wrote the Constitutions and sent the first companions on a mission to the world. You are founded on the origins. It is the grace of these Roman years: the grace of the foundation, the grace of the origins. And you are a nursery that brings the world to Rome and Rome in the world, the Society in the heart of the Church and the Church in the heart of the Society. The second verb is to grow. You are called in these years to grow, sinking the roots. The plant grows from the roots, which are not seen but support the whole. And it stops giving fruit not when it has few branches, but when the roots are dry. To have roots is to have a well-grafted heart, which in God is able to expand. To God, semper maior, we respond with the magis of life, with a clear and irrepressible enthusiasm, with the fire that blazes inside, with that positive tension, always growing, that says "no" to any accommodation. It is the "trouble to me if I do not proclaim the Gospel" of the Apostle Paul (1 Cor 9:16), it is the "I did not stop a moment" of St. Francis Xavier (Letter 20 to St. Ignatius), it is what St. Albert Hurtado urged him to be a sharp arrow in the sleeping limbs of the Church. The heart, if not dilated, is atrophied. Do not forget this. If it does not grow, it fades. There is no growth without crisis - do not be afraid of crises, do not be afraid - as there is no fruit without pruning or victory without struggle. To grow up, to take root means to struggle relentlessly against every spiritual worldliness, which is the worst evil that can happen to us, as Father de Lubac said. If the worldliness affects the roots, goodbye fruits and goodbye plants. And for me, this is the greatest danger in this time: spiritual worldliness, which leads you to clericalism and so on. If instead growth is a constant act against one's ego, there will be much fruit. And while the enemy spirit will not give in trying to find your "consolations", insinuating that you live better if you have what you want, the friendly Spirit will gently encourage you in goodness, to grow in humble docility, going forward, without tearing and without dissatisfaction, with that serenity that comes from God alone. Someone who has bad thoughts will say, "But this is Pelagianism! No, this is a comparison with the Crucified Christ, with whom you will make the interview, the one mentioned above, because only with the grace of the Lord can we go on this path. I would like to mention two positive signs of growth, freedom and obedience: two virtues that advance if they walk together. Freedom is essential, because "where there is the Spirit of the Lord, there is freedom" (2 Cor 3:17). The Spirit of God freely speaks to everyone through feelings and thoughts; it can not be enclosed in tables, but must be received with the heart, on the way, by free children, not by servants. I wish you to be free children who, united in diversity, struggle every day to conquer the greatest freedom: that of themselves. Prayer will be of great help, prayer never to be neglected: it is the legacy that Father Arrupe, the "swan song" of Arrupe left us at the end. Read that appeal, the conference that gave the Jesuits in the refugee camp of Thailand. Then he took the plane and landed in Rome, where he had the stroke. And freedom goes with obedience: as for Jesus, for us too the food of life is to do the will of the Father (cf. Jn 4:34), and of the fathers that the Church gives. Free and obedient, following the example of St. Ignatius, when he was long awaited at Villa d'Este and, meek and decided at the same time, in complete freedom presented to the Pope the total obedience of the Society, in a Church that certainly shone with gospel customs. There is a snapshot of the grown adult Jesuit. Freedom and obedience give life to that creative way of acting with the Superior. Once I told a group of Jesuits who were preparing - I believe - to become superiors, that the General of the Company was a shepherd of "a flock of toads", because the freedom of the Jesuit, with the initiative, leads to many initiatives and the poor Superior must go from one side to the other ... To make unity not with mild sheep, but with toads! And this is true, it is important. But where is the guarantee of this link with the Superior, of this unity? In the statement of conscience. Please never leave this, because it is what ensures the possibility of the Superior to support the "herd of frogs", to bring it to a different harmony, because he knows you and tomorrow you will receive the account from him, because we are all brothers who know each other well. Freedom, obedience, account of conscience as a method, as a path. Found, grow and finally mature. It is the third verb. It does not mature in the roots and in the trunk, but by putting out the fruits, which fertilize the earth with new seeds. Here the mission comes into play, putting yourself face to face with today's situations, taking care of the world that God loves. St. Paul VI said: "Everywhere in the Church, even in the most difficult and leading camps, at the crossroads of ideologies, in the social trenches, there has been and there is a comparison between the burning needs of man and the perennial message of the Gospel, there were and there are the Jesuits "(Discourse on the occasion of the XXXII General Congregation of the Society of Jesus, 3 December 1974). These words are in the message that I think was, perhaps, the most profound of a Pope to the Society. In the most intricate junctions, in the border lands, in the deserts of humanity: here the Jesuit is called to be here. It can be found as a lamb among wolves, but it must not fight wolves, it must only remain lamb. Thus the Pastor will reach him there, where his lamb is (cf. St. John Chrysostom, Homily 33 on the Gospel of Matthew). Passion and discipline in studies contribute to this mission. And it will always be good to approach the ministry of consolation to the ministry of the Word. There you touch the flesh that the Word has taken: by caressing the suffering members of Christ, it increases the familiarity with the incarnate Word. The sufferings you see do not frighten you. Bring them before the Crucifix. They are brought there and in the Eucharist, where patient love is drawn, which knows how to embrace the crucifixes of every age. Thus patience matures, together with hope, because they are twins: they grow together. Do not be afraid to cry in contact with harsh situations: they are drops that irrigate life, make it docile. Tears of compassion purify the heart and the affections. Looking at you, I see an international community, called to grow and mature together. The College of Jesus is and is a gym active in the art of living including the other. It is not just a matter of understanding and loving each other, perhaps sometimes of putting up with each other, but of bearing one another's burdens (cf. Gal 6: 2). And not only the burdens of mutual fragility, but of the different histories, cultures, memories of peoples. It will do you so much good to share and discover the real joys and problems of the world through the presence of the brother who is beside you; embrace in him not only what interests or fascinates, but the anguish and hopes of a Church and a people: to widen the boundaries, shifting the horizon every time, always a little further. The blessing I give you can also reach your countries and help you to found, grow and mature for the greater glory of God. I thank you and I ask you to pray for me. Thank you.